So when I was home last week, in between cuddles from my dog Simba, large mouthfuls of divine food, and general happiness, I realized my fingers were itching to bake something. I didn’t want fancy. I wanted comforting and wholesome and warm. Something like home. And something like that has to be made with ingredients you’d always have at hand. A little bit of kneading, chopping, and whisking later I had exactly what I wanted. 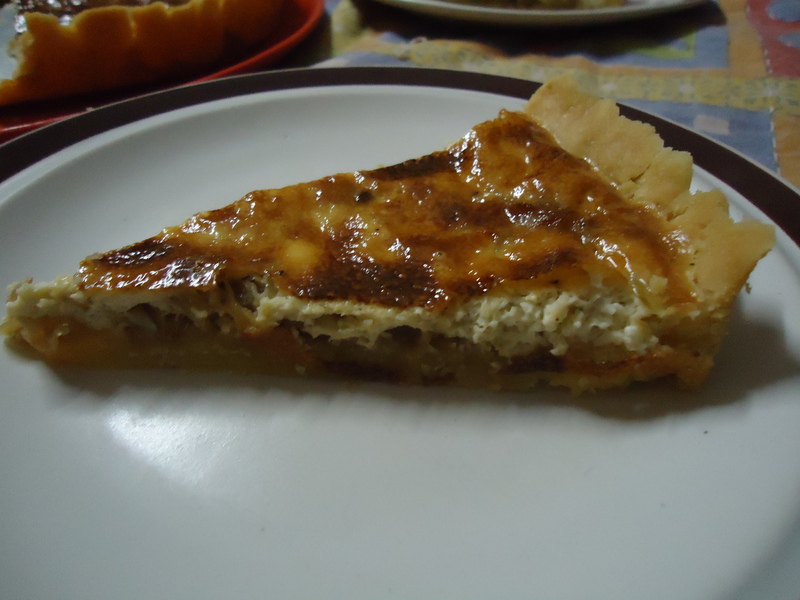 The tart case was flaky and buttery. The caramelised onions were a beautiful honey-colour and slightly sweet. And the cream and eggs provided an undeniable warmth. One slice of this baby, and you’re guaranteed to close your eyes in a deep sigh. 1. Rub the flour and butter together in a large bowl until you have fine crumbs. Beat the egg yolk with 1 teaspoon of cold water and add it to the crumbs. Bring the mixture together with your hands to form a soft dough. Wrap in cling film and chill for 1 hour in the refrigerator. 2. 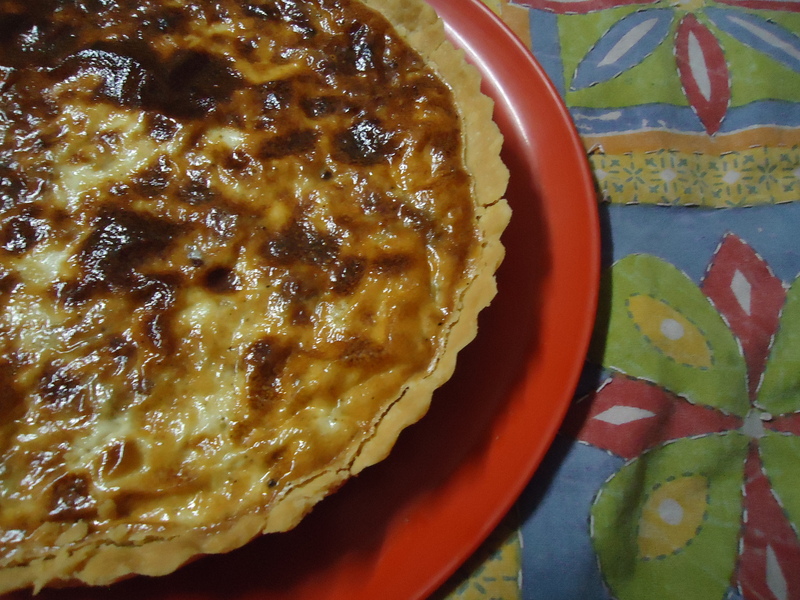 Preheat the oven to 180º C. Lightly grease a 22 cm (9in) loose-bottomed tart tin with butter. Roll out the dough gently and then use your hands to spread it evenly all around the base and sides of the tin. Make sure there aren’t too many bumpy parts. Use a fork to make some holes all over the dough and then cover with some baking parchment. Top with baking beans and bake for about 25 minutes. Take out from the oven, remove the parchment and the baking beans and pop back in the oven for 5 minutes more. Remove and leave to cool. 1. Heat the oil and butter in a large non-stick pan. Add the onions and season well. Cook on high heat until the onions just begin to brown. Then reduce the heat to low, cover and cook for 20 minutes, stirring once in a while. Remember that we want the onions to become soft, but not burn them. Take the cover off, and cook on a medium heat for about 5 minutes till any liquid in the pan dries up. 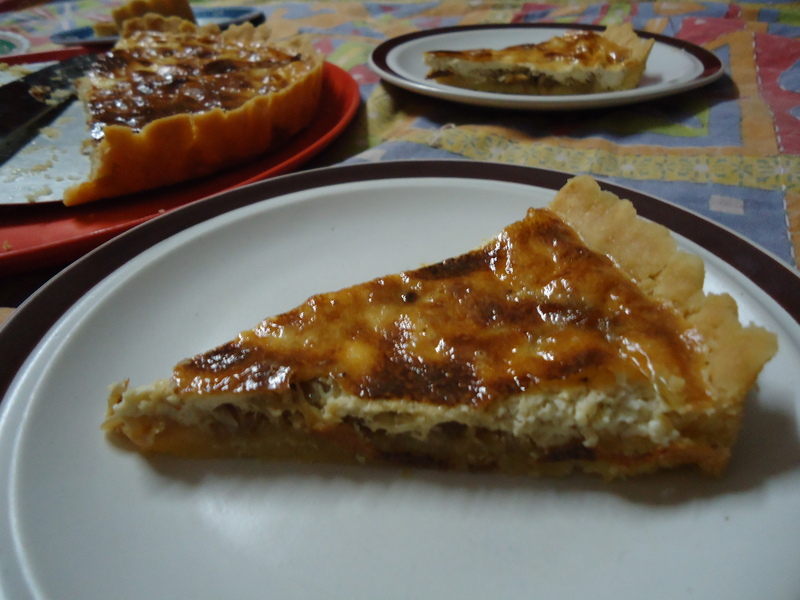 Once sightly cool, spoon this onion mixture into the cooled tart case. Spread it out evenly all over the base. 2. 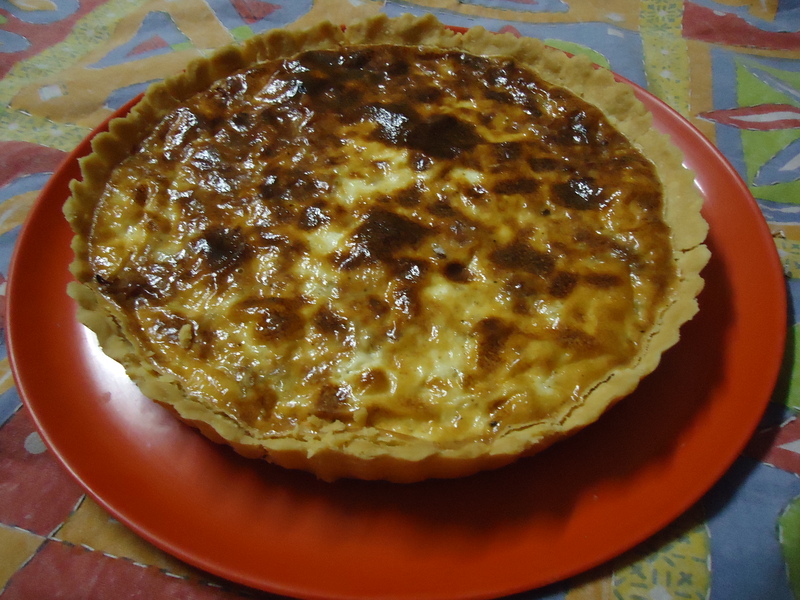 Preheat the oven to 180º C. Whisk the cream, egg, and yolk together and season well. Pour this mixture over the onions and spread it out evenly.